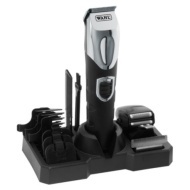 alaTest ha raccolto ed analizzato 18 recensioni su Wahl Deluxe Grooming Station. La media della valutazione per questo prodotto è 4.3/5, confrontata con la media della valutazione di 4.3/5 per altri prodotti. Abbiamo analizzato differenti valutazioni di esperti ed utenti, età del prodotto ed altri elementi. A confronto con altri prodotti, Wahl Deluxe Grooming Station ha ottenuto un alaScore™ complessivo di 86/100 = qualità Molto buono. I bought this a couiple of weeks ago and i'm really impressed already. It seems good for use all over and straight forward to use. Charge seems to last a while as well. Well worth the money! I bought this couple of weeks ago and have no problem whatsoever. It came with variety of comb sizes to cater for different hair lengths and styles. Thought this would be a good product but doesn't actually charge!! Threw away all the packaging so cant return... £35 wasted. What a great little shaver,cut my beard trimming time down by half,even managed to\ntrim my moustache succesfully. Bought this for my husband to keep nicely groomed. Works well. Cuts nice and evenly. I have been using this for a couple of weeks now. Its great. Only minor issue is changing the blades is not as easy as it could be, but once I figured it out its not hard.\n\nGives a great beard trim and the foils are good too. I'm so disappointed with this item. I bought this item a week ago. I bought because the high stars recommendations. But even after charging it overnight, it just doesn't seems to work. I'm just trying to find time to take it back. Bought to replace my old shaver... As most of it is now somewhere in Brisbane and sundry...\n\nEasy to use, efficient and loads of charge.\n\nFor some reason it's asking me to add a video. Nobody needs that.